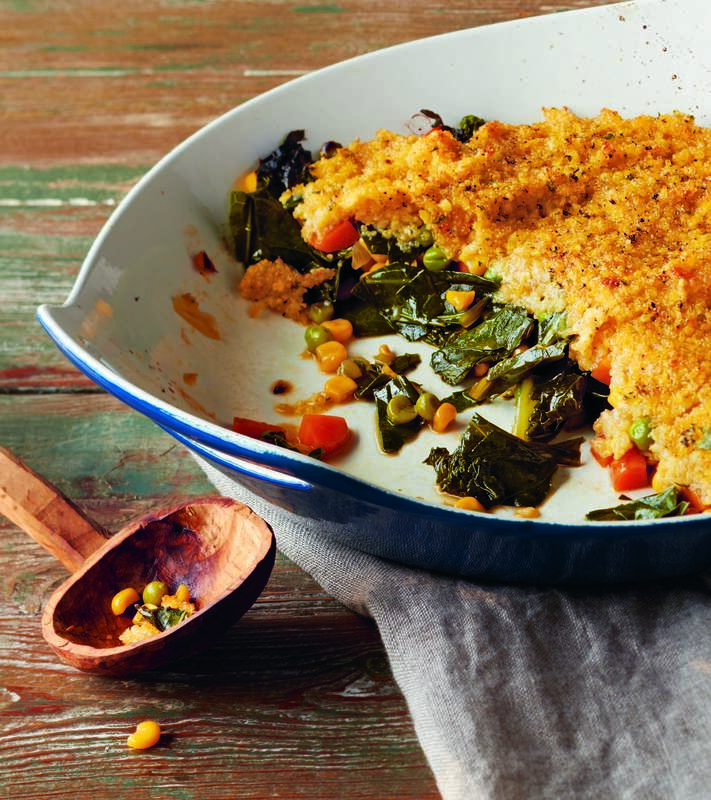 When my children were young, I made this one-dish meal with frozen veggies and a more traditional pie crust. As they became more adventurous eaters, I added more dark leafy greens, and eventually exchange the crust for this hearty whole-grain topping. I'm not sure my family even remembers the original version, but they definitely love what it has become. 1Place millet and amaranth in pot or rice cooker with vegetable stock and salt. Bring to boil, cover, reduce heat and simmer until all liquid is absorbed. Remove from heat and set aside. 2In large Dutch oven over medium heat, sauté onion in oil 3 minutes or until soft. Add carrots, peas and corn and continue sautéing to heat through. Add mirin, fold in kale and collards, and sauté until tender and bright green. 3In small mixing bowl, whisk together water, tamari and arrowroot. Pour over vegetables, stir until sauce starts to thicken and remove from heat. Transfer to pie plate or casserole and set aside. Turn on broiler. 4When grains are done, fold in dried parsley and season to taste with salt and plenty of black pepper. Stir to combine and spread evenly over vegetables. Drizzle with olive oil and broil 5 minutes to yield a creamy grain topping with a crisp crust. Remove from oven and serve hot. 1Substitute polenta for grains and 1½ cups chopped tomatoes with their juices for 1 cup water and tamari.